I got a new camera, so here are some photos from trying it out. 18.06.2011 I guess it has been a while since i did anything with the website. I have just moved to a commercial host. Sorry the site was down for so long. 30.03.2009 Levelled and recrowned the Strat's frets. Added new links. 22.02.2009 Finally put up the Photos from XMAS in NZ.Also added some information on my two newest guitars, a Yamaha SG1000, and a Fender American Standard Strat. 28.05.08 Photos from Xmas 2007(Finally) and photos of a weekend in Kärnten in May. 10.12.06 Added home page photo of the kids dancing. 05.11.06 Working on the firewall countour to fit a 13B. 14.09.06 A few new photos of Sophie. 13/SEP/2006 Christian and I have bought a kitset aircraft project. It is a Mustang II. 01/NOV/2005 Started working on a micrometer spindle stop for the lathe. 06/08/2005 Uploaded family pictures from early August. 20/JUL/2005 Uploaded two new pages of family pictures. 05/MAY/2005 have been making slow progress on the mill head. 13/NOV/04 Making good progress on the head for FrankenDeckel. 28/AUG/04 added a photo to my shed. 12/JUL/04 Added links to John Moran and the Internet Craftsmanship Museum. 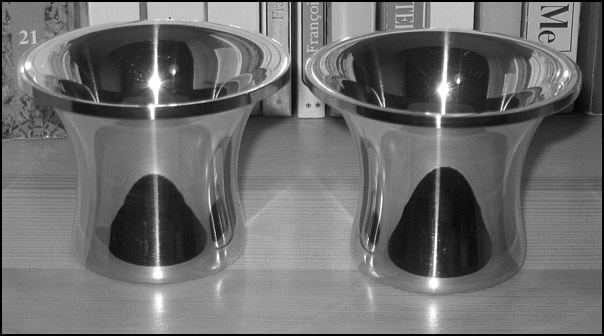 I have been busy making some Bell mouths for a friends Wankel engined RV-4 aircraft. 21/APR/04 I've been busy with business trips and sick kids, but have done a bit on the enclosure. I changed my mind on the QCTP. Bought a Sherline Industrial ER16 collet Spindle for FrankenDeckel. Model 6508. Seems very nicely made, and the people at Sherline industrial were very friendly and helpful. 21/MAR/04 Continued the Alignment checks on the lathe tailstock. 15/MAR/04 Added photos from our NZ trip to family album. 14/MAR/2004 Updated Guitar review to add pictures. 08/MAR/04 It's been too cold in Vienna to get much machining done on the balcony lately. I just started working on the enclosure for the the lathe. As is typical for me, I have about 10 different lathe projects running concurrently. I ran my cross slide into the live center, knocking my tailstock further out of alignment (Sieg T/S's are crap at best). Decided to do a thorough alignment check. 30/DEC/03 Corrected the ZMX backplane board, and etched a new one. 29/DEC/03 I've been working on the QCTP, and a back plane adaptor for the ZMX microstepping drivers which will power the FrankelDeckel. 21/DEC/03 Started working on an Indexable Quick Change Tool Holder for FrankenSieg. 17/NOV/03 By order of my Mum, I have added some more family pics. 14/NOV/03 Added to T-Slot Cross slide. 09/NOV/03 T-Slot Cross slide added. Found a great deal on stepper drivers at Phytron. Put up simple home page. Inserted place holders in each folder.